I just hope it really was a Weezer cover band, and not Wilco. The run wasn't fun, but it was a good race. 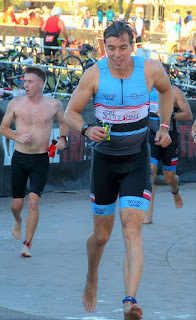 Last year, I was worried about a foot injury and took it easy, but had been training pretty hard on swimming and cycling for IM FL. This year, my feet were fine, but I hadn't been doing much training focused on this race. How hard could it be? 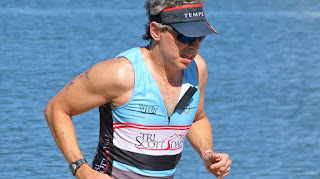 It was just another Tempe tri around Town Lake. Well, with the heat, it was pretty hard (probably 90 degrees by 10 am). The non-wetsuit-legal swim was fine, but the start and first leg of the loop was more exciting than usual. My start wave (men 50+) had a lot of swimmers, and the width of the course, a tight channel between the boat docks and the bridge arch, meant that swimmers were closer together while sighting into the rising sun -- so I was dodging and swimming around (and over) other swimmers for 500+ yards. On the bike segment, my tri bike hadn't been reassembled precisely right, so I couldn't use the big ring at all (although most of the time in my age group, the big ring is only for show anyway). Then on the run, it was a 2-loop course, so the second loop was hotter and harder, and required a lot of effort, until the very end. I don't know if I've ever been more depleted at the end of an international tri; it felt much harder than usual. My time was 3:05:43, which put me 4/11 in my division, 269/491 overall. That's 12 minutes faster than last year, when I was 410/601 overall, but 3/5 in my division (this year, I picked up 2 minutes on the bike, 2 minutes in transitions, and 8 on the run). Darn that (fellow TriScottsdale member) Billy Dean who decided to have his 60th birthday this year. 4000 meter open water swim at Canyon Lake. 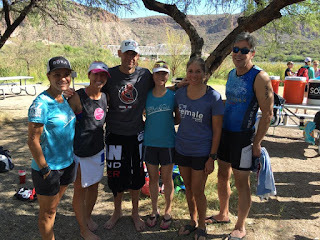 Beautiful day, and what was a pretty good swim for me (1:22:52 without a wetsuit) -- but which put me last among Masters men, 33/36 overall. Those other people were fast. Results here.